Does the black mold give you a headache? You clean it once and soon after ugly black patches arise again. Do you suffer from some health issue caused by the presence of black mold? Do you hate the way black mold pattern diminishes the beauty of your cozy home? 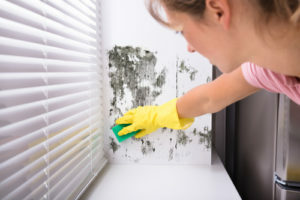 If so, it’s time to get rid of mold in your home properly, so we’ve prepared some useful advice on how to clean black mold from walls from professionals that deal with mold removal in Laguna Niguel. Whether this is your first encounter with black mold, or you’re unsure whether you’re dealing with mold or not, you need an efficient way to get rid of mold regardless of the surface on which it has formed. Prepare affected area for cleaning. Remove all furniture, decorative elements, and electrical equipment from the place. Don’t forget to cover visible surfaces, like windows and floors with plastic sheets; otherwise, you’ll have extra cleaning work. Simply pour a little bit of dishwashing liquid on a sponge dampened with warm water and clean the dirt or remains from the wall. In case the mold covers only a small area of the wall, then you should try the less aggressive approach and treat it with natural agents. Simply put a little bit of white vinegar in warm water and apply the solution with a sponge on the damaged area. Clean it, rinse with water, and wipe off the area with a dry towel. If this doesn’t work or the black mold has spread, then try with a standard mold remover. Just apply it on the affected area, leave it about ten minutes, and scrub well with a brush until the mold spots come off. Rinse the surface and dry it with a towel. Cover the surface with plastic sheets to catch black mold spores that may escape during the cleaning. Mark the damaged area – preventively mark a larger portion that goes beyond the visible black mold patch because mold spores have probably slipped in adjoining areas. Cut the damaged sections with a knife. Carefully eliminate the section that covers at least two of the wooden beams behind the drywall. Cautiously remove the damaged part of drywall and place it on the previously set up plastic sheet. Clean the room with a HEPA vacuum to eliminate mold spores that break loose. Before replacing the drywall, it is recommendable to paint the wall cavity with a mold-resistant paint. The process of mold cleanup can easily become too exhausting, not to mention the dangers that come with DIY approach. When done improperly, mold removal can only exacerbate the issue, causing more health problems and increasing mold damage in your home. If you want to be completely sure that mold is effectively removed from the affected areas (some of which you are probably not even aware of), there’s only one answer to the question: ”How to clean black mold from walls?” Turn to a reliable, professional mold removal service for help! Emergency Home Solutions is your go-to company for all your plumbing, water damage and mold removal needs! EHS prides on the most efficient and top-notch mold removal service in Orange County and fifteen years of experience can prove it. Rest assured we know how to clean black mold from walls because we have the skills and the proper equipment to get rid of it once and for all! Call us today and let professionals clean black mold from your walls once for all!